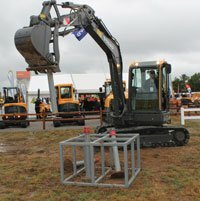 Every two years, the International Construction and Utility Equipment Exposition (ICUEE) descends upon Louisville, Ky. 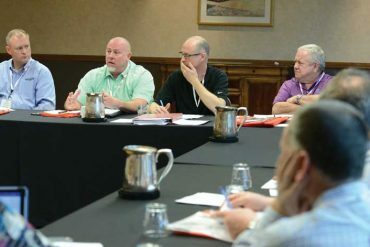 The event, also known as the Demo Expo, is the premiere event for utility industry professionals to gain comprehensive insight into the latest technologies, innovations, insights and trends affecting their industry. 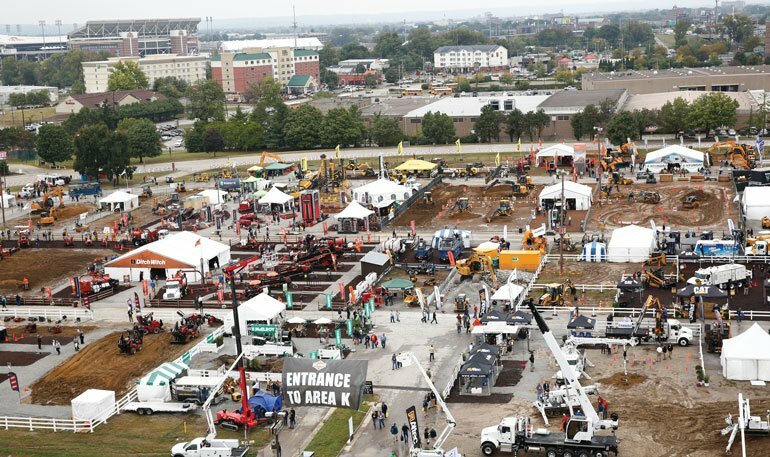 This year, ICUEE 2017 — which is being held Oct. 3-5 at the Kentucky Exposition Center — will be the largest in the show’s history with more than 28 acres of exhibits and a record 900-plus exhibitors. Benjamin Media Inc. (BMI), NUCA’s Official Media Sponsor and publisher of Utility Contractor, is once again hosting the Demo Stage at this year’s ICUEE show. Attendees will be able to see and experience first-hand what new technologies and best practices exhibitors have to offer. The stage will run during show days and will be located near the entrance to South Wing B. Be sure to swing by the Demo Stage for the ICUEE Benefit Auction on Oct. 5 from noon to 2:00 p.m. All proceeds raised during the auction will once again be donated to The Call of Duty Endowment, which raises money for organizations that place returning veterans in high-quality jobs — like construction — and raise awareness of the value that veterans bring to the workplace. “We are very pleased to welcome back the Call of Duty Endowment as our charitable partner,” said Mallett. “Unemployment among post-9/11 veterans is 2.6 times greater than the national average, so the work of the Endowment is more critical than ever. To help plan your time, we’ve gathered offerings from a handful of ICUEE exhibitors over the next six pages. For more information on the show, visit www.icuee.com. Akkerman guided boring contractors are tackling up to 42-in. steel casing installations in rock with the Rock Drill Adapter (RDA), the Guide Rod Swivel (GRS) 50 and the Rock Boring Unit (RBU). The RDA provides a means for an accurate pilot tube installation in rock formations up to 18,000 psi using TriHawk Drill Bits. To follow the pilot tubes, the GRS-50 family matches common steel casing diameters and functions to keep pilot tubes stationary while the assembly’s cutter head, equipped with durable carbide gage cutter bit tooling, excavates difficult ground while able to withstand continuous thrust loads up to 50 tons. For more info, visit booth K105 or www.akkerman.com. Barbco’s FlexBor method is designed to virtually eliminate inadvertent returns that are often associated with horizontal directional drilling. In addition, the FlexBor system reduces expenses by requiring one head to create the needed hole diameter and often shortening the length needed to install the product. This gets the machine’s centerline on or close to the elevation of the proposed bore. The use of augers within allows for the cuttings to be removed mechanically and controlled with the assistance of air and/or water. The cuttings and down hole pressures are retained in casing while being carried to the surface. For more info, visit booth K283 or www.barbco.com. Case offers six new mini excavators: the CX17C, CX26C, CX33C, CX37C, CX57C and CX60C. 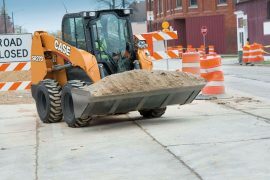 This new offering expands the Case mini excavator lineup to its broadest range of sizes ever and provides a more comprehensive and feature-driven compact excavator solution to the construction, utility and landscaping markets. Each new model features a variety of standard features designed to improve productivity and performance. The new machines feature a zero tail swing, short-radius or conventional design, adjustable boom offset for improved maneuverability in congested areas and an auto-shift travel system for operator convenience. For more info, visit booth K277 or www.casece.com. 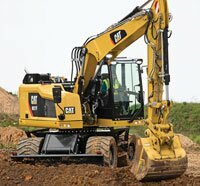 The new Cat M315F and M317F compact radius wheeled excavators are additions to the recently launched Cat F Series wheeled excavator range, reflecting the same customer focused design concept of their conventional radius counterparts, but providing customers the added choice of compactness. The new models make no compromise in power, performance or stability, compared with their non-compact counterparts and feature large working envelopes, high breakout forces and high lifting capacities. The new compact radius models offer a wide range of configurations, including undercarriage options and stick lengths. For more info, visit booth K135 or www.cat.com. ICUEE attendees can experience the next generation of Ditch Witch horizontal directional drills, the JT40 and JT40 All Terrain, which uses advanced drilling system technology to conquer the toughest of drilling environments. Show attendees can also test the Ditch Witch HDD virtual reality training simulator, the latest technology and component of the Ditch Witch HDD Certified Training program. The technology allows users to simulate a real HDD jobsite via its two-screen display and joystick. The VR simulator accelerates training for new-generation HDD operators without compromising jobsite safety. For more info, visit booth K155 or www.ditchwitch.com. The utility mount P185WDOU offers a free-air delivery of 185 cfm and rated operating pressure of 100 psi to meet a variety of applications. The above deck portability provides towing capacity for larger machinery. 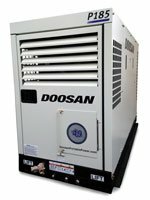 The utility mount P185 air compressor was designed with the operator in mind by offering easy access to all major service points, leaving more time for the job at hand and less time spent on maintenance. The model is equipped with full-sized, locking end doors that make for faster inspections of fluid levels and filters, plus quick access to the battery and the spin-on oil separator for easy maintenance. For more info, visit booth K385 or www.doosanportablepower.com. GPS Insight offers tailored GPS tracking and E-Log solutions to fleets with trucks and other mobile assets. 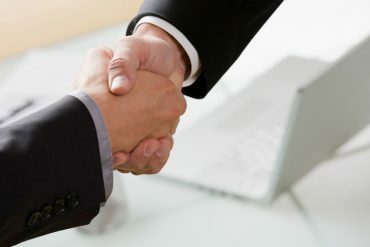 GPS Insight offers three products tailored to your business needs. The Standard option is for small businesses (2-25 vehicles) looking for a simple, yet effective GPS tracking solution. Pro is typically for growing businesses (26-100 vehicles) with a large enough fleet that requires more sophisticated GPS tracking software. Enterprise is designed for large fleets (100-plus vehicles) with complex business structures that require highly custom data to effectively manage your fleet. For more info, visit booth 4419 or www.gpsinsight.com. 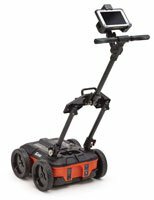 UtilityScan from GSSI boasts a compact size that makes it extremely portable and easy to maneuver in tight survey areas. Designed specifically to meet the needs of electrical contractors, utility installers and municipal and state gas and water utilities, UtilityScan is the smallest utility locating GPR system on the market. Weighing only 34 lbs, it measures 22 in. by 19.25 in. by 12.5 in. when folded and can fit in the back of a small vehicle or in some overhead airplane compartments. For more info, visit booth 3026 or www.geophysical.com. The HG2200 winch from HammerHead Trenchless is designed for maximum efficiency and ease-of-use in pipe-bursting, slip-lining or slitting applications. The HG2200 takes just minutes to set up or tear down. Radio-remote control enhances ease-of-use, productivity and safety. Operators launch the patented hydraulic boom with the touch of a button and can fine-tune depth to 20 ft with the precision controls. Line payout speed is adjustable from 0 to 100 ft per minutes and pulling speed is 0 to 60 ft per minute. Line pressure is adjustable from 0.5 to 22 tons. 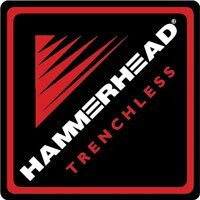 For more info, visit booth or www.hammerheadtrenchless.com. 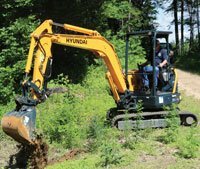 The Hyundai R35Z-9A excavator is powered by a Yanmar engine delivering 23.7 hp. Its maximum digging depth is 10 ft, 3 in., and its maximum reach at ground level is 17 ft, 1 in. Bucket breakout force is 6,900 lbf. In its standard configuration with a canopy, the R35Z-9A has an operating weight of 7,800 lbs. When specified with an optional cab, the machine’s operating weight is 8,470 lbs. 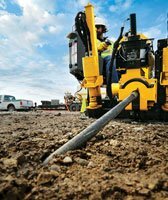 Standard features such as a thumb bracket, large dozer blade, hydraulic quick-coupler and hydraulics-ready auxiliary piping provide the versatility needed to take on a variety of jobs. 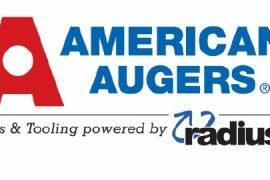 For more info, visit booth K345 or www.hceamericas.com. JCB’s 110W Hydradig wheeled excavator features an all-wheel drive, four-wheel steer chassis with three-mode steering, making it simple to maneuver the machine even in congested urban areas. A side-mounted, 108-hp, Tier-4-Final JCB EcoMAX engine places the machine’s center of gravity up to 5 ft below that of some competitive machines. 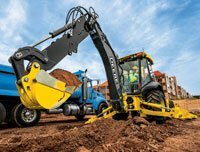 Able to travel at up to 25 mph, the Hydradig has an incredibly tight turning circle of just 12 ft, 11 in. on single tires. The machine’s reduced tailswing allows it to lift heavier loads and rotate or change attachments within a single-lane roadway. For more info, visit booth K175 or www.jcb.com. The John Deere L-Series lineup boasts seven dynamic and efficient models — the 310L EP, 310L, 310SL, 310SL HL, 315SL, 410L and 710L. The 310SL HL heavy-lift backhoe is a prime example of implementing customer feedback. It boasts significantly more craning capability at the push of a button, and along with the 410L, the 310SL HL can deliver up to 25 percent more backhoe-lift capacity under normal conditions than comparable K-Series models. Utilizing the sealed-switch module (SSM), operators can get an additional 10-15 percent boost through the new Lift Mode feature. For more info, visit booth K245 or www.johndeere.com. 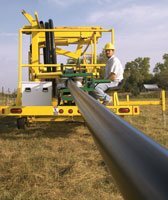 With the McElroy LineTamer, you can quickly install coiled polyethylene pipe, conduit and duct. An entire coil of pipe can be installed with a minimum of two fusion joints. The LineTamer straightens and re-rounds coiled pipe to meet or exceed ASTM D2513 ovality requirements. It removes coil set for speedy installations on the jobsite. The 3- to 6-in. IPS LineTamer comes equipped with 4- to 6-in. re-rounding rollers, optional 3- to 4-in. re-rounding rollers and the unit is powered by hydraulic controls for ease of operation. The 2-in. IPS LineTamer allows you to quickly straighten and re-round 2-in. IPS PE pipe, conduit and duct. For more info, visit booth K140 or www.mcelroy.com. The Vermeer MEGA VAC VXT truck series is a highly productive vacuum excavator designed to meet increasingly strict weight regulations. Ideal for utility and distribution contractors, the VXT Series is a reliable, cost-effective solution for high-production potholing crews. The new 6-in. PTO-driven series comes in three standard spoil capacities ranging from 1,200 to 2,000 gal. The VXT Series is powered by the industry-proven OMSI Gearbox and a ROOTS 3,200-cfm blower. 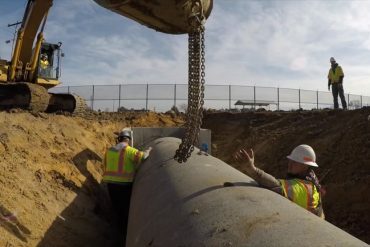 The new CAN control system allows for two-way communication between the remote control and the vacuum excavator, which helps contractors increase jobsite productivity. For more info, visit booth K120 or www.mclaughlinunderground.com. The CB56 cradle boring machine is powered by a 350-hp diesel engine, high-torque gearbox with radial and thrust bearings, a 65-ton winch and multiple setups for shackles to increase boring thrust power. The CB56 features many innovative features and safety benefits, including load sensors, safety screens, casing adapter plates and many more. The cradle bore machines are also available in 24-, 36- and 42-in. models. Four 56-in. diameter cradle bore machines have been operating in the Middle East with excellent results since early 2013. For more info, visit booth 4630 or www.byrnegroup.com. With extensive experience in plastics manufacturing, Oxford Plastics offers a comprehensive trade molding service, specializing in in-house product design. 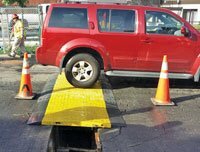 Collaborating with industry leaders, the new heavy-duty composite 23-05 modular RoadPlate has been engineered to span up to a 3-ft trench, in full compliance with HS20-44 load rating. The 23-05 can span up to a 4-ft trench when in a pedestrian load setting. The 23-05 meets anti-skid requirements, has chamfered edges and many other features that DOT officials require. Huge savings are obtained by eliminating the cost associated with transporting and handling heavy steel plates. For more info, visit booth 3734 or www.oxfordplasticsUSA.com. Ring-O-Matic will give ICUEE attendees the first look at its newest and largest-capacity PTO-driven vacuum-excavator system. The Ring-O-Matic 1300 VXT Extreme/PTO offers single-engine emissions compliance, reduced engine maintenance requirements and a shorter chassis rig with 1,300-gal spoil capacity for use in utility construction, horizontal directional drilling support and mud management, vacuum excavation and daylighting operations. Mounted on a double-axle, 60,000-lb Freightliner carrier featuring a 1,700-cfm blower and a 6-in., fully hydraulic boom, the rig is customizable with a wide array of Ring-O-Matic options to match any operation’s requirements. For more info, visit booth K160 or www.ring-o-matic.com. The Commander 7 display offers enhanced capabilities to the TK RECON Series HDD Guidance System and delivers all vital tracking data to both the tracker and drill operators. Commander 7 is compatible with both Apple iOS and Android devices. It has an expanded communication range, faster data rate speeds and a large, high-resolution 7-in. screen with intuitive, user-friendly icons. The Commander 7 offers users three ways to view their tracker data, including an all new Advanced Drill-To mode featuring PerspectiveView — an intuitive leap forward in data presentation that the company claims is “truly out of the box.” For more info, visit booths K375 and 2645 or www.subsite.com. Thunder Creek Equipment introduces the industry’s first combination diesel and diesel exhaust fluid (DEF) transfer tank for pickup trucks. This exclusive combo tank provides 100 gallons of diesel and 18 gallons of DEF capacity that fits seamlessly into the bed of pickups (half-ton and larger — including goosenecks and fifth wheels) with both pumping systems concealed within its structure — no elements protrude from the tank. The sleek design ensures excellent rear visibility by taking up no more than half of the rear window. Both fill nozzles are located on the driver side and extend out 10 ft from the tank. For more info, visit booth 4805 or www.thundercreek.com. 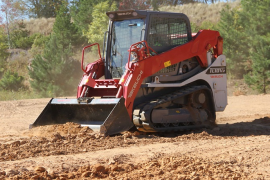 In addition to featuring its full lineup of horizontal directional drills (HDD), trenchers, compaction products, vibratory plows and Toro Dingo compact utility loaders, Toro will also showcase the brand-new TDOS-1 with SmartTouch drill operating system which streamlines pipe handling operations for improved HDD cycle times. 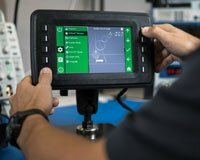 TDOS-1 with SmartTouch also provides a more visually appealing and intuitive interface for accessing drill functions and information on the drill display. Features include the ability to select single- or dual-joystick mode on the fly, as well as easy-to-use torque, thrust and tool rotation selectable limits for quick adjustments to match bore requirements. For more info, visit booth K150 or www.toro.com/underground. Vactor Mfg. will feature the Vactor Paradigm vacuum excavator designed for utility, municipal and contractor customers involved in the installation, maintenance and repair of underground water, sewer, gas, electric and telecommunications lines. The compact, multi-use Paradigm can dig holes with water or air; vacuum, contain and dispose of drill mud; power pneumatic, hydraulic or electrical tools; and provide transport and storage of replacement parts, equipment and tools. 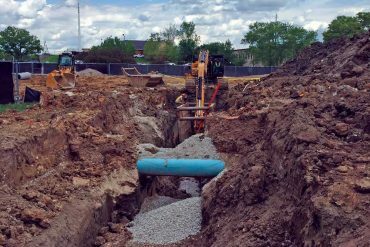 The truck’s “Park-n-Dig” design minimizes the time between arriving on the jobsite and excavation, including the ability to dig up to 6 ft in depth without additional pipe and hose. For more info, visit booth 4906 or www.vactor.com. Vac-Tron Equipment’s full fleet of truck-mounted PTO Series vacuum excavators will be on display. The Hydro Truck Vac (HTV) PTO driven systems are available with 300- to 800-gal debris tanks. The PTO of the truck drives positive displacement vacuum blowers that produce 1,000 cfm. The Jetter Truck Vac (JTV) PTO combines vacuum excavation with high-pressure jetter capabilities. It also comes standard with reverse pressure, 800-gal debris tank, 300-gal water supply and 500-ft by ½-in. jetter hose reel. The Split Shaft Truck Vac PTO-driven systems are available with 500- to 1,200-gal debris tanks and up to 3,000-cfm PD vacuum pumps. For more info, visit booth K233 or www.vactron.com. Vermeer will showcase the newest additions and innovations to its industry-leading lineup of directional drills, tractors, mini skid steers, reclaimers and more, as well as productivity tools for the utility market. By combining documentation, bore planning, data collection and remote monitoring components, Vermeer productivity tools can help contractors better manage their business from planning to mapping and producing to invoicing. For more info, visit booths K225 and K332 or www.vermeer.com. Volvo is pushing boundaries with solutions for utility and construction at ICUEE 2017. 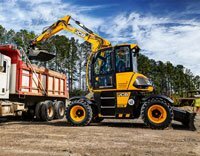 The company will have eight operable machines in the booth — including four new models making their North American debut: the EC27D compact excavator, L20H compact wheel loader and a D-series skid steer loader and compact track loader. Learn about ActiveCare Direct, the 24/7/365 telematics monitoring and reporting service offered directly from Volvo, and enjoy some fun and games with an excavator simulator and virtual reality experience. For more info, visit booth K335 or visit www.volvoce.com.